Software Developers invent technology that we use every day, but may take for granted, like checking our bank balance on our phones, booking a meeting in our personal calendars, listening to music or making a purchase. A software developer will have helped design all the applications that make those things possible for us. Because of this ‘Software Developer’ as an occupation is a rapidly expanding occupation. The Bureau of Labor Statistics projects more than 24% employment growth for software developers between 2016 and 2026, which is much faster than the average growth for all other occupations. It was also recently named Best Technology Job for 2018 according to US News, and in a recent list by CNNMoney of the top 100 best jobs, the job title ‘Mobile Developer’ was placed in the top position. There are a number of benefits to be gained by brands from engaging with influential developers. Developers are very knowledgeable about the niche and can provide you with unfiltered, invaluable feedback on your product, without any inhibitions. Brands can learn a lot about their product and wider product category by reaching out to the developer communities. 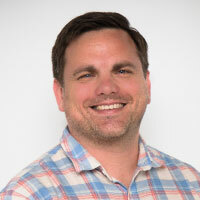 Developers hold the key to product adoption and innovation, and by engaging with them and promoting your tech broadly you will get visibility to groups that might not have otherwise paid attention to you. Some of them may even go on to become evangelists for your product, which will in turn increase your overall brand awareness. 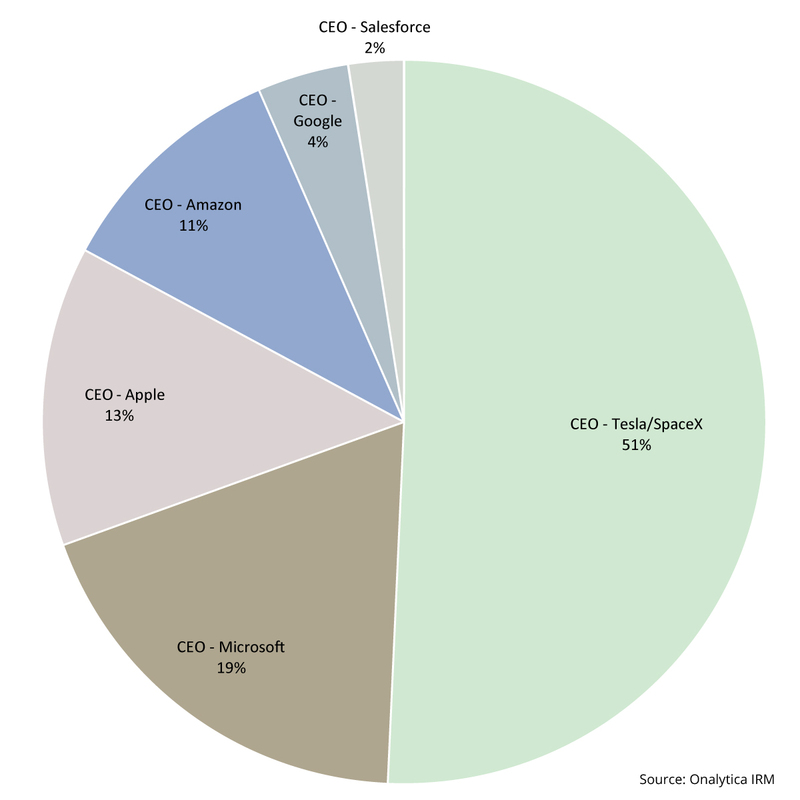 This is why brands like Google, Microsoft, Facebook, Adobe and IBM are investing heavily in Developer Evangelism according to CMX. WHICH BUSINESS LEADERS ARE ENGAGING AND INSPIRING THE TOP INFLUENTIAL DEVELOPERS? 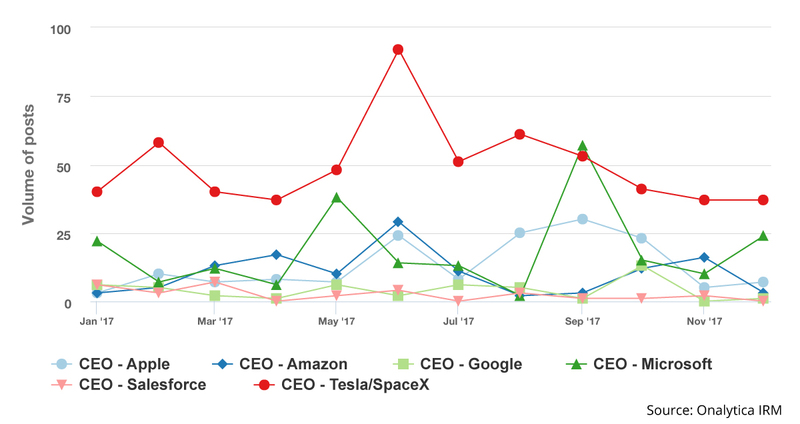 As shown in the share of voice chart below, Elon Musk stands out as the most prominent CEO, receiving 595 mentions by developers throughout the year; 51% of the whole CEO conversation. SpaceX is at the forefront of conversations mentioning Elon, as developers express their excitement by describing the project ‘gnarly’ and sharing educational ‘cool facts’ around the project. Microsoft’s Satya Nadella follows shortly after with 220 mentions from developers, making him the second most mentioned. Developers are the least vocal about Salesforce’s Marc Benioff; primarily mentioning him in relation to his opinions on the role of AI in society. Despite favouring mentions of Elon Musk, the developers’ attention towards the Tesla CEO is seen to steadily decrease towards the end of the year. On the whole, he is viewed as a very positive figure in society; as developers share content on how to ‘be like Elon Musk’ and around his day to day life. Nonetheless, developers are also critical of his work, analysing the threats it could pose to other industries. While mentions of Satya Nadella are lower, these mentions stand out as they see a steady increase as the year goes on. Along with sharing news content around Microsoft event announcements, developers are particularly vocal about Satya’s book Hit Refresh; sharing very positive feedback on the CEO’s outlook and work ethic. 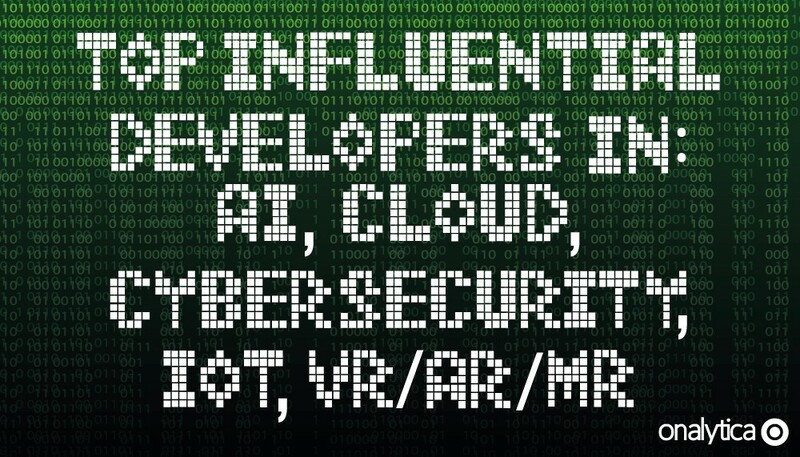 We wanted to dig deeper into some of these top trending topics, so using our IRM software we identified which developers were driving the conversations around AI, Cloud, Cybersecurity, IoT, VR / AR / MR. What follows is a list of the most influential developers in each of those topic areas. Below is a list of the top 25 influential developers in Artificial Intelligence. If you want to see who ranks from 1-50 be sure to download the full report by clicking the download button below! Below is a list of the top 25 influential developers in Cloud. If you want to see who ranks from 1-50 be sure to download the full report. 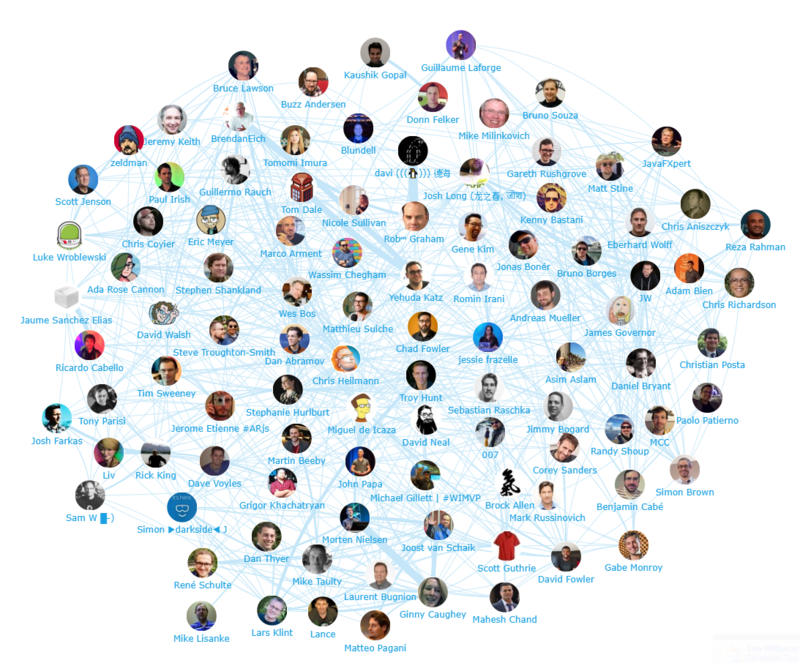 Below you can see a network map of the influential developers’ conversations. This map was created with our Influencer Relationship Management software (IRM). Be sure to click on the map to enjoy the full size network diagram in greater detail. Below is a list of the top 25 influential developers in Cloud. If you want to see who ranks from 1-50 be sure to download the full report by clicking the button below! Below is a list of the top 25 influential developers in IoT. If you want to see who ranks from 1-50 be sure to download the full report. Below is a list of the top 25 influential developers in VR / AR / MR. If you want to see who ranks from 1-50 be sure to download the full report. Disclaimer: As ever with these lists, it must be stressed that the ranking is by no means a definitive measurement of influence, as there is no such thing. 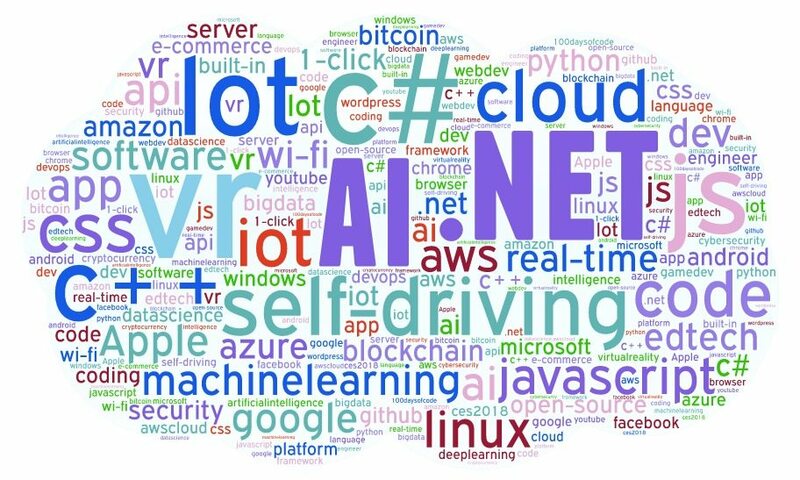 The individuals listed are undoubtedly influential when it comes to driving discussion around AI, Cloud, Cybersecurity, IoT and VR / AR / MR.
Download this free report which reveals the top influential developers in AI, Cloud, Cybersecurity and VR / AR / MR.